« Emit – Capture – Utilize – Store. EV School Buses. Take Two. There are about 550,000 school buses in United States and Canada. Each day some 26 million children ride on school buses. For long school buses have been the ideal candidate to go electric instead of being diesel. Eliminating the exposure of the exhaust from diesel engines would be a significant health benefit. In addition, from the electric grid perspective the battery storage in the school buses could be a valuable resource for balancing the system, thanks to school buses having defined schedules, idle during the middle of the day and parked during the summer. As discussed four years ago, Plug-In-Electric-School-Buses-What-Are-We-Waiting-For? , one would, at a first glance, think EV school buses would be a “no-brainer”, but at a closer look many barriers exist. Especially, the lower first cost for the traditional diesel buses has been hard to overcome for the roughly 3,400 contractors and 10,000 school districts, which in most cases are financially constrained. Probably the first demonstration of an EV school bus was in 1994 in Southern California with a bus built by Blue Bird. It was probably too much ahead of time to be a viable concept. For example, the battery technology was still lead-acid. However, in the last 5 years there have been significant progress. 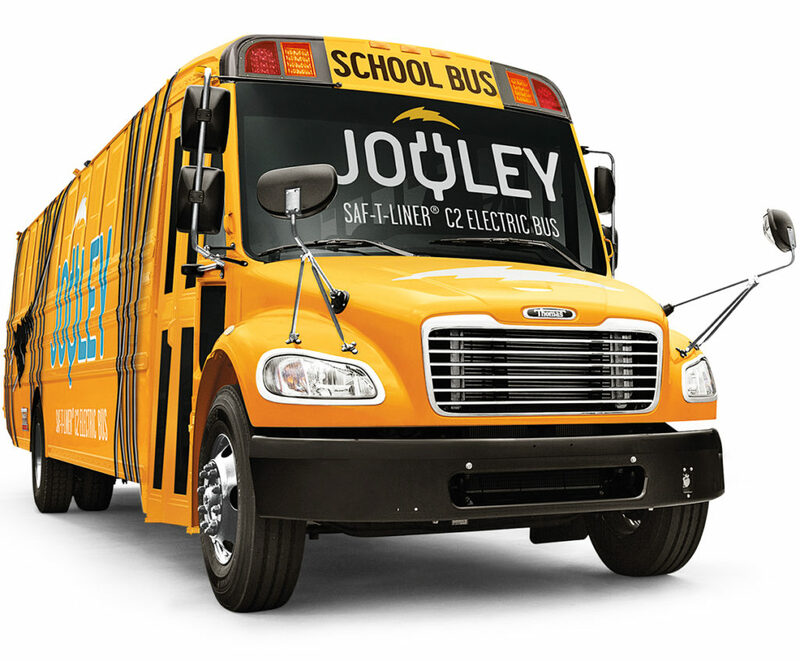 The interest for clean buses have grown substantially and with the lithium ion battery advancements, the idea of EV school buses has become much more viable. Pioneering companies like Trans Tech Bus, have in several pilot programs demonstrated operational EV school buses. In most cases, the buses in these pilot programs have been conversions of traditional school buses to electric drivetrains, developed and supplied by specialist companies like Adomani and TransPower. 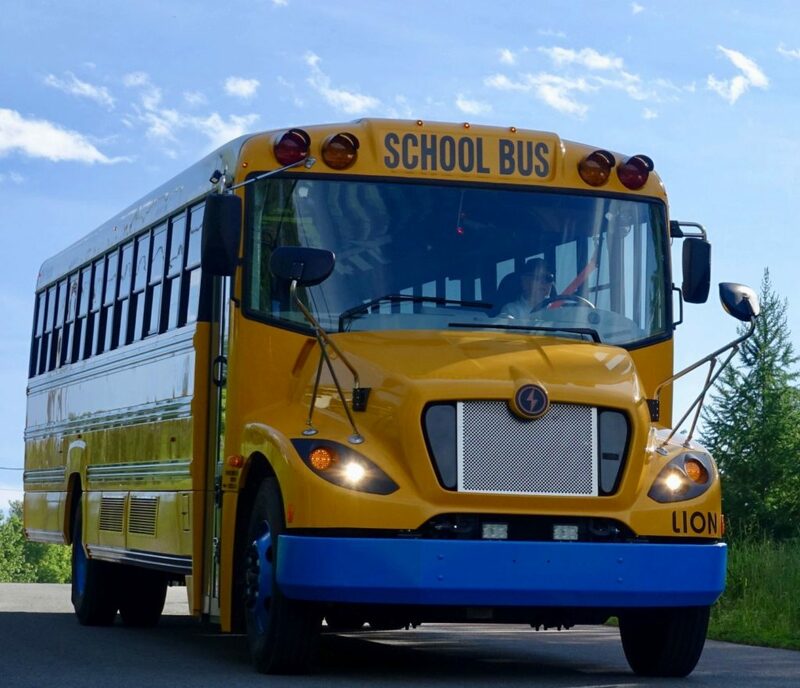 In addition to retrofit EV school buses companies like Lion Electric Co. in St-Jerome, Quebec, Canada, have developed dedicated EV school buses, incorporating also other technical advancements such as composite materials to reduce weight. The school bus, named eLion, was launched late 2015 and started to sell the following year. Lion Electric’s eLion comes with three range options: 50 miles/75 miles/100 miles. Electric drivetrain by TM4. Batteries from LG Chem. Technology progress, especially in terms of electric batteries. Growth of EV city buses. School bus industry starting to embrace the EV concept. Total cost of ownership becoming favorable. Lithium ion battery technology progress, more performance and lower costs, has been evident in the growth of EV passenger cars worldwide. Less visible has been the growth of EV city buses. According to EB Start by the end of 2017 there were 400 EV buses in operation in the US. It represented an 83% growth over 2016. Proterra and BYD are the market leaders. Both companies offer a several models of EV buses. The city of Shenzen (population 11.9 millions), China, announced late last year (2017) that as the first city in the world all of its 16,359 buses had become electric. 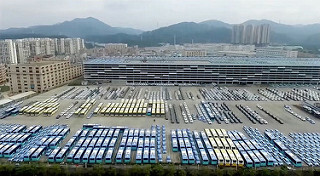 About 80 % of the EV buses were delivered by BYD, which has its headquarter in Shenzen. A combination of national and state subsidies as well as leasing arrangements helped finance this transition. Three companies dominate the school bus industry: Thomas Built Buses, Blue Bird Corporation and IC Bus. In a remarkable turn of events, all three of them last year (2017) presented EV school buses. Thomas Built Buses, which is owned by Daimler, presented its first EV school bus with the basic option of a 60-kWh battery providing a range close to 100 miles. It is planned to be available in 2019. Reportedly Thomas Built Buses have started to take orders. Thomas Built Buses’ Saf-T-Liner C-2 electric bus, nicknamed Jouley. The bus is equipped with a bidirectional charger, providing V2G (vehicle-to-grid) capabilities. Blue Bird presented two new EV school buses at the STN Tradeshow in July last year, one type D and one type A. They target start of production later this year (2018). Blue Bird had also been awarded a $4.4 M DOE (Department of Energy) grant in 2016 to develop a Type C Vision EV school bus. For the type D EV school bus Blue Bird works together with California-based Adomani. The drivetrain is supplied by Efficient Drivetrains Inc. (EDI). The batteries will have 100-150 kWh capacity providing estimated 80-100 miles range on a single charge. Also, IC Bus launched their concept EV school bus, chargeE™, last year, expected to be commercially available in 2019. IC Bus, which is part of Navistar International Corporation, is using an electric drivetrain from Volkswagen Truck&Bus. The first version will have a range of at least 120 miles. In a recent (March 29 2018) report, Electric Buses in Cities, Bloomberg New Energy Finance concludes that the total cost of ownership (TCO) already can be cheaper for EV buses than conventional buses thanks to lower operating and maintenance costs. The report predicts that EV buses will reach unsubsidized upfront cost parity with diesel buses around 2030. Nevertheless, until EV school buses on a first cost basis are on par with diesel school buses, financial support to bridge that gap will be necessary, in order for EV school buses to really take off. One example how it can be done was shown in May last year, when Sacramento announced a fleet of 29 EV school buses to serve three school districts in the Sacramento area. It was the first of its kind in the U.S. The initiative was possible thanks to a $7.5 M grant funding from proceeds of California’s cap and trade program, and $7 M in cost share with the nine project partners, including Sacramento Municipal Utility District (SMUD). Probably the best opportunity to accelerate EV school buses may come from the 2016 federal court settlement with Volkswagen (VW) after VW was found to have intentionally programmed TDI (turbo charged diesel injection) diesel engines to activate the maximum emissions control only during emission tests. In real world driving NOx emissions could be up to 40 times higher. As part of the settlement VW agreed to pay $2.7 billion to states to reduce NOx emissions. Through a trust, Environmental Mitigation Trust, the money will be distributed states in proportion to the number of diesel vehicles sold. It will range from $7.5 M to $381 M per state. The money is expected to start becoming available this year. What better use of these funds than for EV school buses?! !